I was a guest on HuffPost Live this week in a segment purporting to discuss the ins and out of workplace bathroom etiquette. We’ve been here before, but it seems like bathroom etiquette at work is the hot topic that just won’t go away. It was one of those slightly awkward four-way video chats but overall I thought the host did a good job of getting the different guests involved – myself, Michael Podell and Jill Jacinto. That said, it turns out that the discussion had absolutely nothing to do with etiquette – it was all about shame. It seemed like nobody involved could get over the fact that taking a big poop at work was anything other than an act to be downplayed, concealed, or outright avoided. Techniques to avoid smells, avoid noises and avoid letting your coworkers know what you were up to were all that was discussed. Which is fine. I get that not everybody is completely comfortable with taking a massive poop at work. I get that not everybody wants to come out of the stall after a noisy session to be confronted with their boss. But let’s get one thing clear right now: this has nothing to do with etiquette and everything to do with shame. Taking poops is exactly what the bathroom is designed for. I don’t care how loud or stinky your poop is, there is nothing about taking that poop that makes it bad etiquette. Poop all you want in the bathroom, that is the whole point of that room and pooping is a perfectly natural bodily function. Now I’m not advocating that you get in the stall and start grunting and groaning – that’s something that is completely in your control to avoid doing, and excessive grunting is certainly bad etiquette. But natural poop noises and smells are just part of life. The BBC (the BBC!) 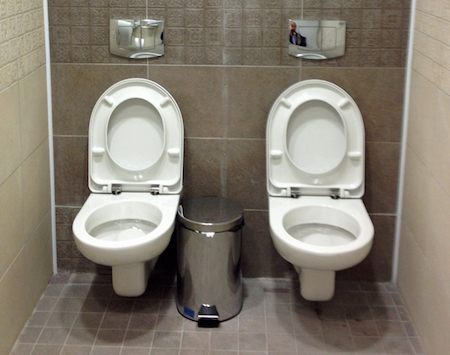 is reporting on a mysterious double toilet that has appeared in advance of the Winter Olympics in Sochi. Materializing inside the Laura Cross Country Skiing and Biathlon Centre, this double toilet appears poised to humiliate and traumatize athletes from across the world (well, at least from the cold countries). 1) Two toilets, no partition. 3) What appear to be the remains of a partition between the two toilets. Based on these this information it seems like the area was originally designed for one toilet (one TP dispenser). However, we can guess that toilet was never installed in the middle, as there is no evidence of moving a toilet. So it seems like somebody installed the first toilet on one side, and then had the brilliant idea of installing another in the remaining space. At first they put up a partition, but then realized the partition prevented the second toilet from accessing the TP. That’s where the insanity started. For whatever reason (no budget to buy one?) rather than install a second TP dispenser, they simply removed the partition allowing the second toilet access to the first dispenser (if you can call reaching across somebody else access). Think I’ll stick to pooping at home thank you very much! A few years ago it was all the rage to do a study showing how much more bacteria there was on your keyboard than a toilet seat – heck, we even mentioned one of those studies here at the ICBE. Does it really surprise anybody that a toilet seat, that you clean on a regular basis, has fewer random bacteria than your keyboard, which you clean never? Is that yogurt dirty and dangerous? No, it’s delicious! I don’t know what show this is from, or even if the caption was actually said on that show, but whatever the case I do know this: the marker poop is one of the most frustrating poops there is. 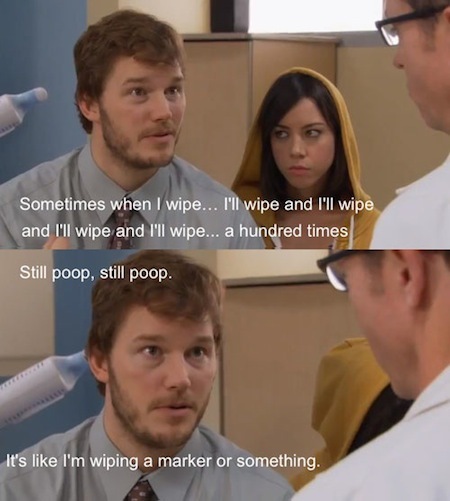 You just keep wiping and wiping and wiping and wiping… and at some point you just kind of give up. Something unusual happened to be today. Not something extremely special or wonderful, but something that doesn’t happen very often. I needed to go poop immediately after weighing myself. I found this to be rather interesting because it gave me the rather rare opportunity to do something that most people never do – see how much weight I lose after going poop. I was cautiously optimistic that I would lose at least 2 or 3 pounds from a proper BM. Bathroom etiquette is a serious business (ha!). But every once in awhile something comes along that puts a smile on my face, and/or makes me laugh out loud hysterically and pester my wife until she looks at it and then gives me a funny look wondering what’s wrong with me. A group of 3rd, 4th, and 5th graders, accompanied by two female teachers, went on a field trip to the local racetrack (Churchill Downs) to learn about thoroughbred horses and the supporting industry (Bourbon), but mostly to see the horses. When it was time to take the children to the bathroom, it was decided that the girls would go with one teacher and the boys would go with the other. 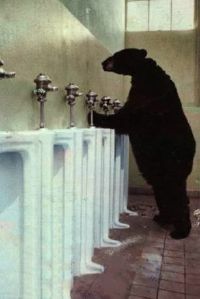 The teacher assigned to the boys was waiting outside the men’s room when one of the boys came out and told her that none of them could reach the urinal. Having no choice, she went inside, helped the boys with their pants, and began hoisting the little boys up one by one, holding on to their ‘wee-wees’ to direct the flow away from their clothes. Oh, and btw, there’s no etiquette against using such a toilet. If you dare! CTA Digital bills itself as offering “Quality Gaming and Multimedia Accessories“, but as far as I can tell from their website they mostly sell a lot of junk. 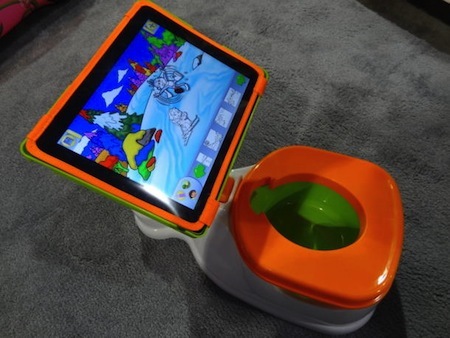 That’s all about to change though, as the company recently released the iPotty at CES! Thanks to Mrs DC for the heads up!